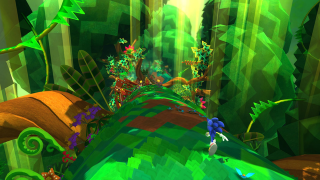 Silent Forest (サイレントフォレスト Sairentoforesuto) is the fifth world of Sonic Lost World. As the name implies, this level is set within the darkest forests of the Lost Hex, with some dark ruins to be found above the canopies. Early into this world, Tails is kidnapped by the Deadly Six. In the 3DS version, the player can gather Iron Material here. The first Zone has Sonic traversing tubular planetoids that mostly consist of harmful swamps full of mechanical crocodiles that will ambush Sonic, and rafflesias that serve as stepping stones. The later parts of the stage are full of rails for Sonic to grind along on, providing he watches out for classic Badniks such as Cluckers, Dragonflies and Mushmeanies, as well as minecarts and more crocodiles. The Crimson Eagle also makes a return. The second Zone takes Sonic above the canopies where he must traverse ruins under the night sky as tango music plays. Throughout this Zone, stealth gameplay comes into play as Zor will be using a giant owl mech to beam searchlights throughout the Zone; should Sonic be caught, he will be abducted by bats, and a life is lost. To avoid detection, Sonic must hide behind bushes so the searchlight cannot see him. The Magenta Wisp and its Color Power, Magenta Rhythm, can be found and used to jump across chasms. Zone 3 is set within an underground tunnel like the one seen in Windy Hill Zone 3. This time around, the floors of the tunnel are frozen, making maneuvering much more difficult, and jumping more dangerous. 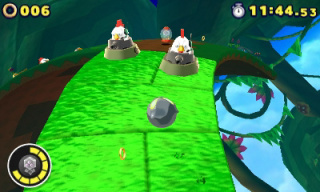 Cluckers and Bombs are also scattered around to make this Zone more dangerous, so the player will need more precision and grace to make it out alive. The Cyan Laser is also used here. The fourth Zone has the player explore some old ruins. Late into the Zone, the ruins become dark, and everything inside (including Sonic) will be rendered as silhouettes. The darkness also makes it impossible for Sonic to lock-on to enemies with the Homing Attack, so he must pull down light switches to illuminate the ruins and make the enemies susceptible to Homing Attacks. Additionally, the Yellow Drill obstacle course from Desert Ruins Zone 4 makes a return partway through the Zone. At the end of the Zone, the player fights Zor again. At the start of this Zone, the player is on a planetoid with flowers that catapult Sonic to three different areas he must clear. The first two areas begin with skydiving sequences, eventually leading to mazes of grey pillars that must be destroyed using the Gray Quake, and then use said Color Power to slam switches that activate bridges to allow the player to move forward. Along the way, Cluckers and giant turtle Badniks will try to impede progress and must be destroyed. After the first two areas are done, the player goes through one last skydiving sequence that leads to the capsule. A great deal of the second Zone has Sonic grind on rails and cross disappearing bridges suspended above a massive chasm with few pieces of land between them, with the occasional Spinner that Sonic must attack to reach distant rails. Most of the pieces of land require the player to defeat Badniks such as Moto Bugs, Slicers and Orbinauts, or to perform parkour to cross chasms to proceed. Near the end of the Zone, the player will cross electrical rails that will harm them unless they use Ivory Lightning or a Lightning Shield. Zone 3 is set in the ruins above the canopies like Zone 2 from the Wii U/PC version. Throughout most of the Zone, the player must pass through pathways full of grind rails and presses that will try to crush the player, as well as parkour off of disappearing walls while avoiding Cluckers. Near the end of the Zone, the player must avoid being spotted by Zor's owl mech; however, getting seen is not an instant kill in this version, and will instead cause pillar traps to appear and try to crush Sonic. Not counting Hidden World and the DLC levels, this is the only world in the game that did not appear in Sonic Runners.